Did you know that Bratislava is the third greenest city in the world for tourists after Reykjavik, Iceland and Auckland, New Zealand? 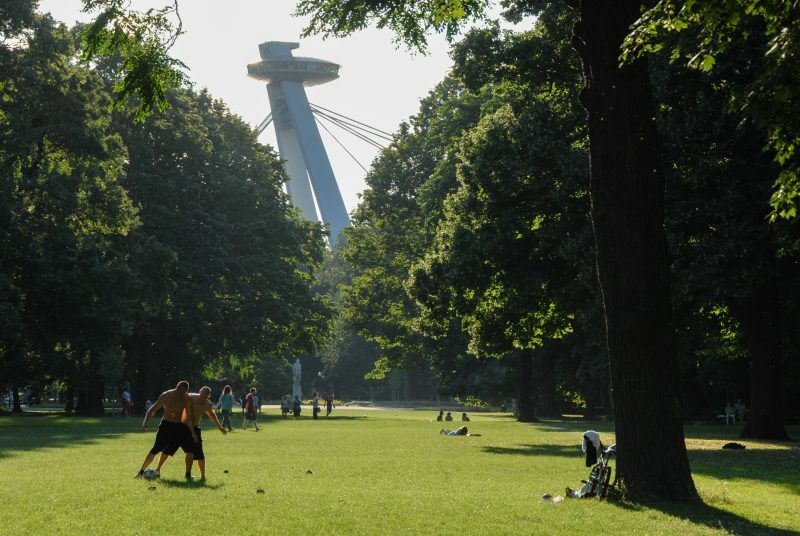 This is thanks to Bratislava’s bevy of parks right in the city centre as well as its location on the Danube and proximity to the forests of the Small Carpathians mountains. In Bratislava, it’s just a stone’s throw away from the vibrant city centre to nature. Take a short trip in a city bus or car and you’ll reach the forest park at the foothills of the Small Carpathians in just minutes. 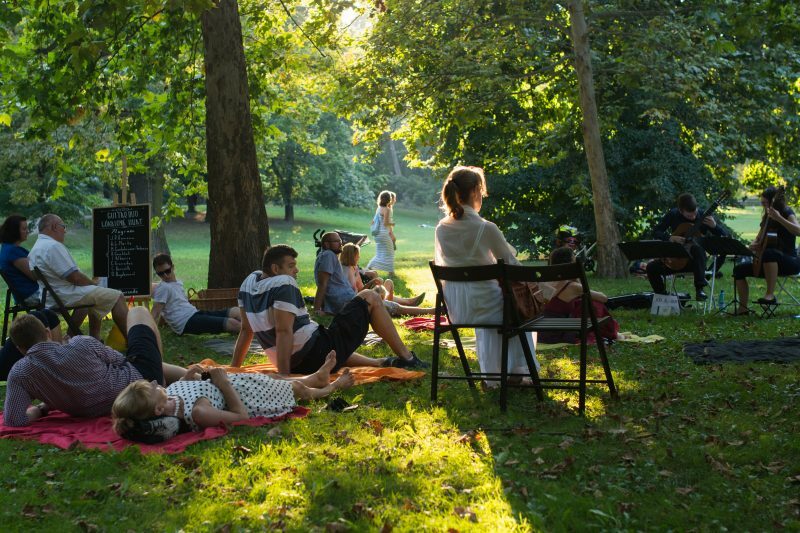 Tourists, runners, families with children, and friends who simply love to picnic will find true relaxation in this green oasis. You can even lounge by the pond or enjoy gorgeous aerial views in the cable car connecting the Kamzík and Železná Studnička recreational sites. If you want to exercise more intensively outdoors, choose from the city’s dense network of cycling routes. Floodplains along the Danube and Morava Rivers offer mild terrain while adrenaline lovers will find dynamic paths, too. 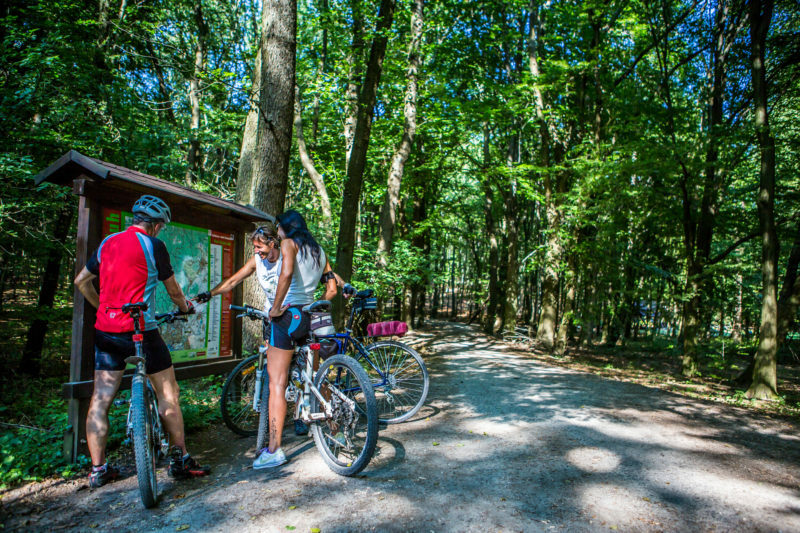 Apart from the more difficult paths in the forest park, four more downhill cycling trails varying in difficulty can be found at the top station of the cable car at Kamzík. Bratislava also offers a much more unusual experience: a romantic night in the forest park in one of two treehouses. Alarm clocks are not necessary as early morning birdsongs and the rustling of leaves will gently awaken you from a restful slumber. “I’m will come back to this fairy tale,” reads a note left by one of the visitors in the treehouse’s chronicle. “The environment is beautiful and absolutely ideal when you want a break because there isn’t a good mobile signal. 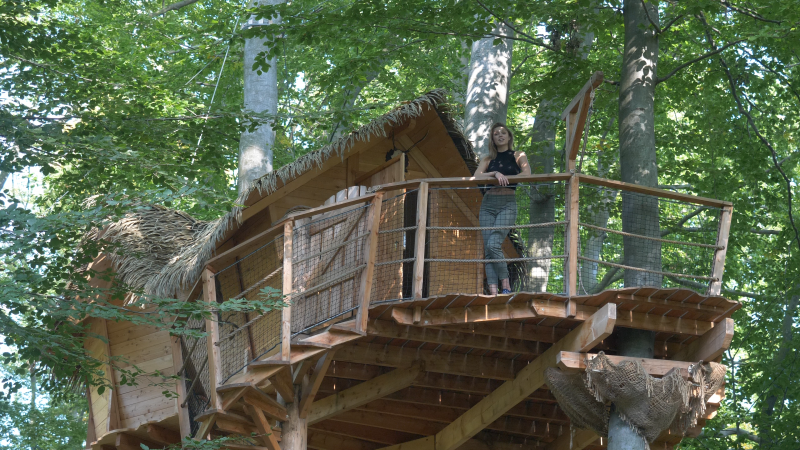 To feel calm it is enough to sit down on the terrace,” says Martina Kohárová of the organisation City Forest in Bratislava, which runs both treehouses. Thanks to the diversity of the environment, Bratislava and its surroundings are one of the most interesting bird watching sites in Slovakia. At Železná Studnička, you can watch the very rare red-breasted flycatcher. For the Slovak “parrot” – the European bee-eater – go to Devínska Kobyla. The water dam Hrušovská Zdrž on the Danube near Čunovo is clearly the best place for watching wintering birds. If you are looking for true natural romance, take a boat trip on the Small Danube. 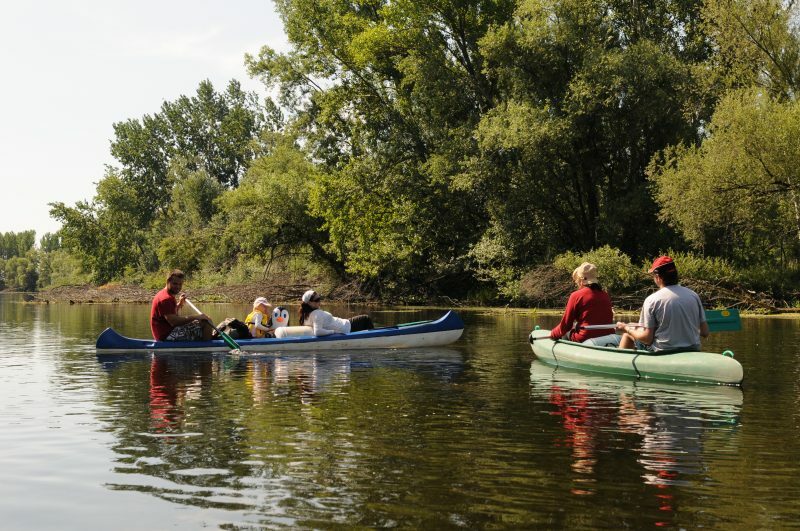 “Trees leaning over the river, beautiful bays and amazing peace,” says Ladislav Krechnyak from a family company organising canoeing in and around Bratislava. Whether you are a beginner or more experienced sailor, the Small Danube is suitable for everyone. The half-day and one-day trips are very popular and a lot of visitors enjoy sailing from Bratislava’s borough of Vrakuňa to Tomášov village. If you have more time, travel down the popular route that runs between the villages of Hurbanova Ves and Jelka. Not only will you get to explore the most beautiful stretch of the Small Danube, but in Jelka you will see one of four historic wooden mills preserved on the river. Even during its royal past, the city cared a lot about its greenery. Fortunately, today you do not have to be of noble origin to enter the baroque garden of the Bratislava Castle. Only recently did it resume its original look from the times of Maria Theresa. Close to the end of her rule, the oldest public park in central Europe, now known as Sad Janka Kráľa, was also established. Located on Petržalka’s side of the Danube, the park offers many paths just waiting to be explored. Visitors can also admire the mighty two-hundred-year-old planes or look for the statue of their zodiac sign. A photograph inside the top of the former gothic tower from the Franciscan church is worth a visit, too. It was moved here after a devastating earthquake hit Bratislava in 1897. When your stomach starts to rumble after a long walk in the park, curb your appetite with traditional Pressburg cuisine in the Leberfinger restaurant, located within the park, or have a look at the capital’s skyline from the ship that was converted into the Dunajský Pivovar restaurant. In addition, you can get a 10 percent discount in both restaurants with the Bratislava CARD City & Region. Other historical parks in the city centre include the Medická Záhrada, Horský Park and the Presidential Gardens.